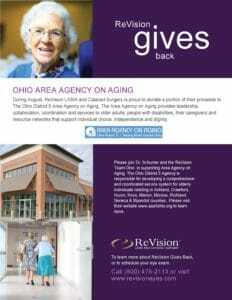 During August, ReVision LASIK and Cataract Surgery is proud to donate a portion of their proceeds to The Ohio District 5 Area Agency on Aging. The Ohio District 5 Agency is responsible for developing an maintaining a comprehensive service system for elderly individuals residing in Ashland, Crawford, Huron, Knox, Marion, Morrow, Richland, Seneca, and Wyandot counties. To learn more about their services, please visit their website. To learn more about ReVision Gives Back or to schedule your appointment please call (800) 475-2113 today.